I have an upcoming EQ6/7 class, “EQ Appliqué Design,” that begins January 18, 2013 at QuiltUniversity.com. Learn to use (and control!) 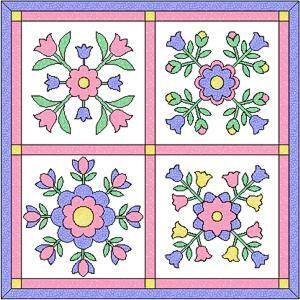 those PatchDraw tools as you create a sketchbook full of appliqué motifs. Hearts, leaves, tulips, posies…are just a few of the design elements you will work with. Learn how to put your new motifs together into different types of arrangements…and learn the basics for using WreathMaker to create one-of-a-kind circular appliqué designs. Hope to see you there! This entry was posted in Electric Quilt, Quilting, QuiltUniversity.com and tagged Electric Quilt, QuiltUniversity. Bookmark the permalink.